Named GYO, the appliance is designed to make home growing accessible for the waves of new growers who are rapidly entering the market as cannabis legalization spreads throughout North America. BloomBoss, a leading manufacturer of high-efficiency, high-performance LED grow lights and related equipment for growing cannabis indoors, has launched a campaign on Kickstarter to raise funds for their flagship home grow box. Named GYO (which is pronounced “jee-yo” and stands for “grow your own”), the appliance is designed to make home growing accessible for the waves of new growers who are rapidly entering the market as cannabis legalization spreads throughout North America. GYO is being co-developed with BloomBoss’s joint venture partner, major Canadian appliance producer Danby, whose 70 years of manufacturing and distribution experience will ensure that the product performs a cut above the competition. GYO contains a turnkey system to grow plants hydroponically – all the consumer needs to do is plug it in to a standard 120V outlet, fill the reservoir, plant their seeds or cuttings, and grow. The appliance is a self-contained environment, with systems to regulate temperature and humidity. Powering the grow is an energy-efficient BloomBoss TrueSun LED, which keeps monthly operating costs low and increases the potency, flavor, and aroma of the cannabis grown in it. “We believe in empowering consumers to take control and grow their own food and medicine, simply because there are innumerable benefits to doing so. However, there isn’t much out there for the inexperienced growers who are becoming interested due to the spread of cannabis legalization. GYO’s all-in-one system will set these growers up for success; and, we’re even including a free year of full plant support from our in-house experts with the purchase of every unit,” said Chuck Siegel, President & CEO of BloomBoss. BloomBoss is taking preorders for GYO via its Kickstarter page at a reduced price of $499 for the first 50 units (50% off the final retail price), and $749 for the following 100 units (25% off the final retail price). 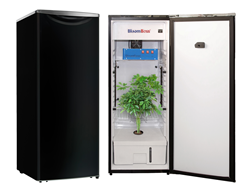 BloomBoss® offers high-efficiency, high-performance LED grow lighting and related equipment and is developing a line of groundbreaking cannabis growing appliances. Our mission is to revolutionize home cannabis cultivation with modernized, energy-efficient products and provide growers of all experience levels with the tools to be successful. To learn more about BloomBoss or make a purchase, please visit http://www.BloomBoss.com.